"Miss Marple bent down on the terrace outside the french window and dealt with some insidious bindweed. It was only a minor victory, since beneath the surface the bindweed remained in possession as always. But at least the delphiniums knew a temporary deliverance." ~ Agatha Christie in Sleeping Murder. A minor victory, a temporary deliverance, that's what weeding really is, isn't it? We pull the weeds. For a brief time, the garden looks well-kept, as though a gardener tends it. We turn our backs. The weeds grow. They were never really gone. Beneath the surface, they waited. Once we accept that weeds have possession of the garden, life in the garden improves immensely, doesn't it? A garden without weeds could not be a garden because nothing would grow there. I'm constantly in the weed battle, I wish I could be resigned to the presence of the weeds but they keep escalating the war. But I learn from the war, so maybe someday I will understand some things about weeds that will help. One thing I enjoy is bringing in plants that are stronger than weeds, so they fight the war for me. Thank you for helping me finally figure out what that twining little weed is in my garden! And now I realize why "beneath the surface the bindweed remains in possession," because the root system can go 20 to 30 feet deep!! Who knew?!! I pull on it and this white fleshy root seems to go on forever. I see that "forever" is not too far off the mark! Yikes. My salvias have only known temporary deliverance -- until now. I might have to pull out the big guns to win this battle. I am not sure I am willing to accept that weeds have possession in my garden -- do they call that living in denial?? I still live in hope that one day I will defeat them.. it keeps me going! I do my best thinking while weeding! 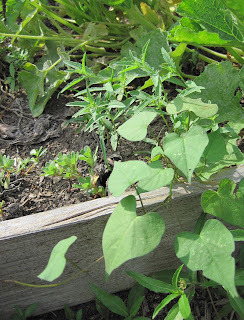 I don't mind weeding, but I do mind bindweed. I found bindweed growing in my garden for the first time this year. I just hope it doesn't become an issue (along with the mares tail). The other weeds I can tolerate. Yes, I fully agree that when one realizes that weeds will be weeds one can enjoy the garden so much more. Wonderful quote - it exactly matches my view each time I pull one (while perhaps missing the inner hope that, maybe, I got the whole thing this time). Happy Bloom Day Carol..and Symphyotrichum indeed--fat chance ! I still say Cimicifuga !